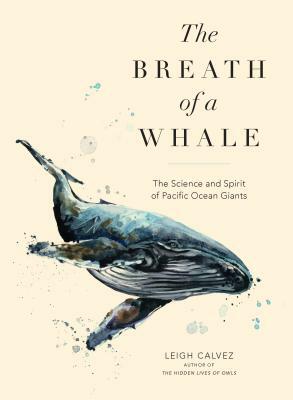 The Breath of a Whale: The Science and Spirit of Pacific Ocean Giants (Paperback) | Eagle Harbor Book Co.
From the author of The Hidden Lives of Owls, an exploration of the elusive lives of whales in the Pacific Ocean, home to orcas, humpbacks, sperm, blue, and gray whales. Leigh Calvez has spent a dozen years researching, observing, and probing the lives of the giants of the deep. Here, she relates the stories of nature's most remarkable creatures, including the familial orcas in the waters of Washington State and British Columbia; the migratory humpbacks; the ancient, deep-diving blue whales, the largest animals on the planet. The lives of these whales are conveyed through the work of dedicated researchers who have spent decades tracking them along their secretive routes that extend for thousands of miles, gleaning their habits and sounds and distinguishing peculiarities. The author invites the reader onto a small research catamaran maneuvering among 100-foot long blue whales off the coast of California; or to join the task of monitoring patterns of humpback whale movements at the ocean surface: tail throw, flipper slap, fluke up, or blow. To experience whales is breathtaking. To understand their lives deepens our connection with the natural world. Leigh Calvez has worked with whales and dolphins as a scientist, naturalist, and nature writer. As a scientist, she was Research Director for the Ocean Mammal Institute on such projects as the effect of vessel traffic on endangered humpback whales off Maui, Hawaii. She also led the only independent research team observing the US Navy's testing of Low Frequency Active Sonar on humpback whales in their nurseries in Hawaii in 1998. As a naturalist, Leigh has worked on whale watch boats in Massachusetts watching humpback and finback whales on the feeding grounds of Stellwagen Bank, in Hawaii on the breeding grounds of the humpback whale, and in the San Juan Islands of Washington State, watching pods of orca whales. She has also led extended whale watching journeys to New Zealand, British Columbia, and the Azores Islands off Portugal. "The Breath of a Whale is as intimate and spirited as its title. This splendid book offers us the whale watch most of us can only dream of: We get close-up and personal with wild giants, in the company of an expert who feels like a good friend. Because these whales' individual dramas are so entwined with those of their observer, the insights in these pages are riveting and deeply inspiring. Leigh Calvez offers not only hope for saving these endangered leviathans, but also for saving ourselves." "Calvez's semi-autobiographical account of several close encounters with whales and dolphins, as well as with the researchers who dedicate their lives to the study of marine mammals, is unabashed in calling for the conservation of whales and protection of their environment. It does so with personality, sensitivity, and clear love for cetaceans." "Leigh Calvez writes well-researched, thoroughly beautiful books that illuminate the lives of animals without stripping them of their essential mystery [...] With The Breath of a Whale, she's going back to her roots as an aquatic ecotour guide, which explains why the book reads like the literary accompaniment to a very excellent whale-watching excursion." "[One of] 2019's Best Books About the Environment..."
"Some of the most striking sections in [The Breath of a Whale] stem from Calvez's remarkable ability to humanize scientific research itself...Though she does a good job explaining the nuts and bolts of cetacean research, equally interesting are the scenes where Calvez shows the connection between whale and human emotions...the book’s main success is connecting Calvez's audience to a magnificent creature that so many of us rarely, if ever, see." "Aims to entertain by sharing...owl adventures in the field, and by discussing mythology and owl obsession."